I am a fan of a great Ambrotype. The lumious golden glow and the rich blacks can convey stunning stories. N.W. Gibbons has crafted a beautiful series on the Rivers of New York, and I can’t stop looking at them. His work is available for a great cause next week at Photographic Center Northwest. PhotoLust is PCNW’s annual fundraiser to support their tremendous and ambitious programming. I have been a student as well as a speaker and supporter of the Center. The auction slate as a whole is a well curated, with lots of photographic treats to take home. N.W. Gibbon’s work is affordable now, with his talent, it won’t be soon. Years ago in my NYC commuter days, I traveled the MetroNorth line along the Bronx River about a million times. It looked pretty desperate in those days (early 1980s). I was interested in this strip of nature, slammed between a busy parkway and the rail lines, hanging on by a thread. Several decades later, I got to meet the river in a better state. Better meaning getting the feet into the mud, listening to birdsong, checking out a mature forest, a gracious meadow — all still slammed in by a parkway and a rail line. 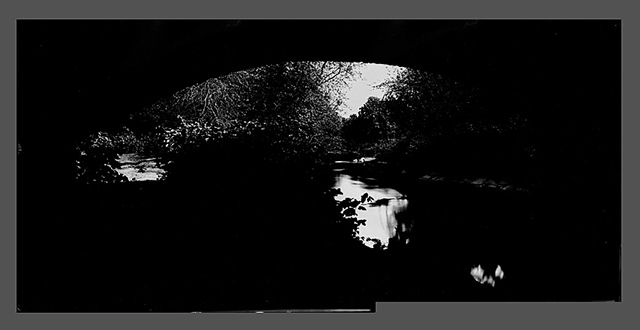 The Bronx River is a part of my “Rivers Project”. This is an exploration of a number of short rivers in southeastern New York and southwestern Connecticut. Each river starts in sylvan beauty (a relative term, but natural enough for these parts) and ends at (usually grimy) Long Island Sound — but with immense pockets of beauty and grace that reward those who take the time to search. I’ve been searching. I’ve also been rewarded. 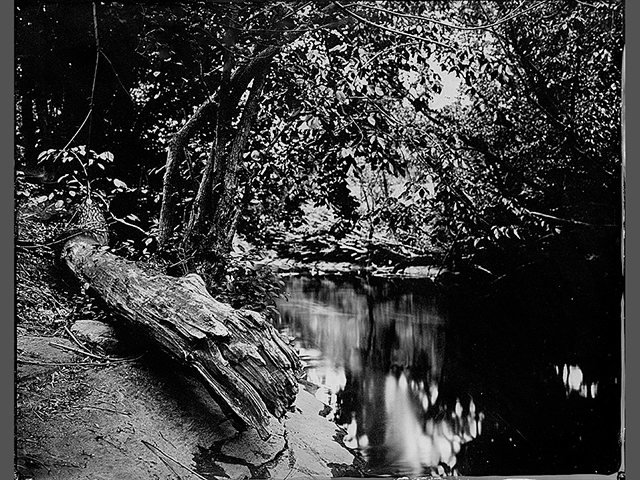 This artistic journey documents these rivers using a 19th century photographic process, the Tintype. Why the old stuff? Incredible detail and superb tonal reproduction. Each image is as unique as the moment it is taken, and there will never be another one like it. This is the real ‘painting with light’. These Bronx River images are survey photographs. Each day on this survey is a logistical and artistic challenge to me. I’m really excited about the Bronx River images because they combine the hard urban cityscape with a surprisingly natural canvas. It has made great images. Many views are large diptychs and triptychs because I want to bring you into these natural spaces and a single plate is not big enough. Technical Details: Tintypes were shot using two 11×14” view cameras: a 19th century Korona View and a contemporary R.H. Phillips. The lens used is a 16 1/2” Goerz Dagor. Exposures were made at f/22 and f/32 at times ranging from 5 seconds to several minutes. The photographic emulsion is a bromide/iodide suspension in collodion that is sensitized in Silver Nitrate, developed in an iron salt solution, fixed with potassium cyanide and finished with a coating of Sandarac varnish. 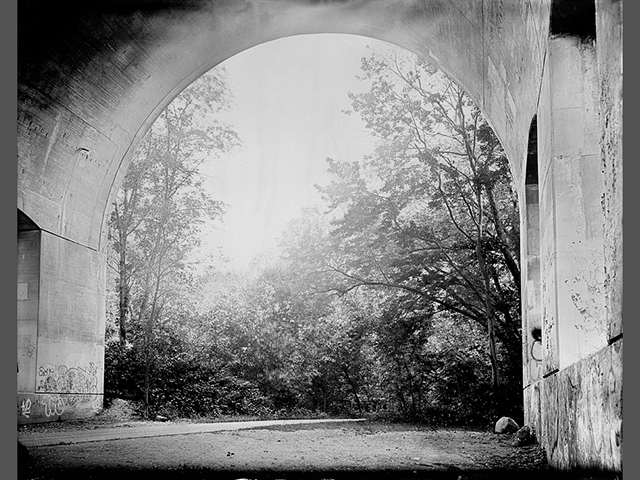 N. W. Gibbons is a fine photographic artist who has been a life long resident of Westport, Connecticut. Mr. Gibbons has worked in large format non-digital photographic media since the mid-1970’s, and most recently has produced work using a number of different 19th century photo processes. Mr. Gibbons creates very large tintypes and ambrotypes, both as single images and in diptych and triptych formats. Tintypes and ambrotypes are direct positive images on metal or glass respectively. Popular in this country from roughly 1865 through 1880, this style of photography is collectively known as “wet plate” due to the fact that exposed plates must be developed before their sensitized surface dries out. Each image is a unique “edition of one” as there is no negative from which to make duplicate prints. Wet plate images are noted for their extremely fine grain images with a long tonal scale. Mr. Gibbons works in 11 x 14” and 18 x 22” formats. He favors cityscapes and landscapes in lower Fairfield County and nearby New York State, most recently working on an extended project documenting the surprising natural beauty of the Bronx River. 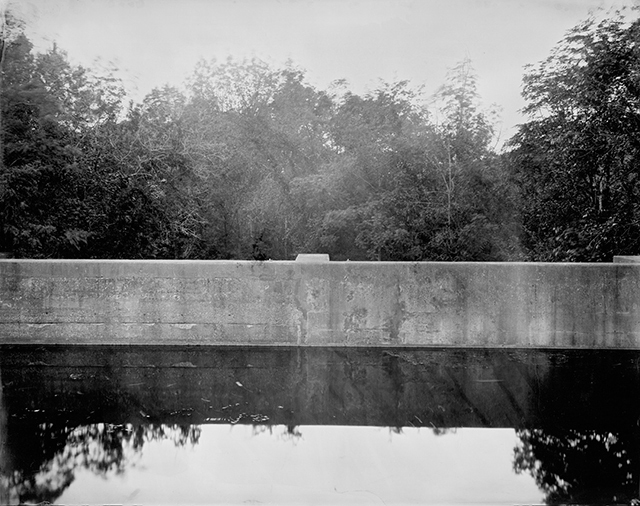 Past bodies of work include the bridges of the Merritt Parkway and the former industrial mills of Bridgeport, Connecticut. Mr. Gibbons’ work is in numerous private and public collections, including the Yale Art Gallery, the Museum of Fine Arts, Houston, and the Library of Congress. When not making wet plate images, Mr. Gibbons is a full-time Fire Inspector for the Westport Fire Department. He is also an Associate Fellow of Branford College at Yale University. All images copyright N.W. Gibbons. Used with permission.